The Lagos State Emergency Management Agency (LASEMA) on Sunday said that four people died as a Lexus Jeep plying one way rammed into a commercial bus on Lekki/Epe Expressway. 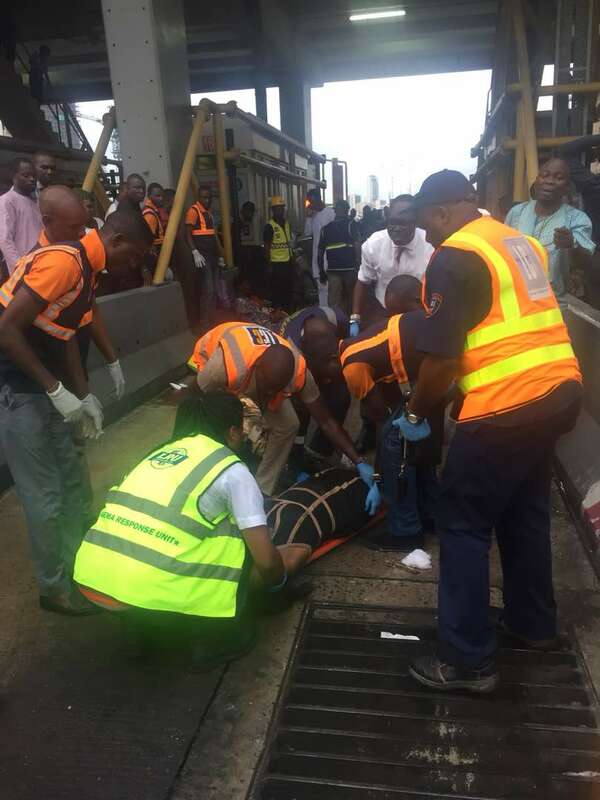 The General Manager of LASEMA, Mr Adesina Tiamiyu, said in a statement in Lagos that the accident happened at the First Gate inward Oriental Hotel, along Lekki/ Epe Expressway. Tiamiyu said that the agency was alerted at about 6.49am on a distress call via the emergency toll free line 112/767 regarding the accident. He said that this prompted the immediate activation of the agency’s Response Team, other emergency responders and the security operatives to the scene of the incident. According to him, investigation carried out by the agency’s Response Team at the scene of the incident reveals that a Lexus Jeep GX470 with registration number KJA-615DF was plying one way. ”The Lexus Jeep ran into a commercial bus (KRE-302XA) that was just cleared by the ticketing officers at the toll gate. ”A total of four fatalities were recorded which includes three adult male and an adult female. ”Sixteen casualties with severe injuries were recorded, including four adult female and 12 adult male. The driver of the jeep was transported to the General Hospital, Marina. ”The LASEMA Response Team alongside LASAMBUS, RRS, Nigeria Police Force, State Environmental Monitoring Unit (SEHMU) and LCCI were responders present at the scene of the incident,” he said. Tiamiyu said that emergency/security operatives were involved in traffic management measures to forestall the occurrence of a secondary accident and crowd control. He said that the operatives gave medical care to the casualties and subsequently moved them down to the General Hospital at Marina and Trauma Centre, at Toll Gate for further treatments. According to him, the two adult male who died at the scene were subsequently handed over to the Lagos State Environmental Health Monitoring Unit (SEHMU), while the remaining two, an adult male and an adult female, were later confirmed dead. Mr Adesina said that the accidented vehicles were recovered off the road with the aid of the agency’s light tow truck and subsequently handed over to the Lekki Concession Company Ltd (LCC) officials, who moved them down to Maroko Police station. He, therefore, advised motorists to always endeavour to drive with caution when driving on highways. The general manager urged motorists to abstain from drinking alcohol before driving, as well as ensure road worthiness of vehicles before embarking on journeys to avoid unecessary loss of lives. Tiamiyu said that the Lekki incident would be further investigated by the security operatives, while the state government would also ensure prosecution of the culprit to serve as deterrence of errant motorists.